The story of the race and a story of a race, The Ronde is both a history of the Tour of Flanders and an account of the 2011 edition. The cycling world might get very excited about roads like this, even fetishise them to an extent, but for the people who live on them on the other 364 days of the year they are ordinary, quiet thoroughfares where not much happens. Pickering visits the region and traces the route of the 2011 race. He tells how he meets the locals, be they simple residents or glorified Flandriens. This procedural element is part of the book’s charms, the serendipitous knock on a door that finds Georgette who tells how her parents ran a café that was frequented by Karel Van Wijnendaele, the man who launched the Tour of Flanders. Similarly we learn plenty about Johan Museeuw when Pickering describes how the interview proceeds, it’s not what the Flandrien says, it’s the long silences that tell us plenty. The format sees these explorations of history, geography and more interspersed with a blow-by-blow account of the 2011 edition of the Ronde. Recounting the 2011 race helps us cross the landscape and anchor the race in the territory but if it works as a literary device, it’s that and a plain book retelling the 2011 edition wouldn’t be gripping although with hindsight the constant theme is the need for luck not to interrupt your rivals while they’re making a mistake. That’s of course was Napoleon’s maxim and the emperor gets mentioned several times when exploring the history of Flanders. There’s history from geology to contemporary politics but apart from one section it’s never like a schoolbook. Instead it’s anecdotes and observations that stand out for example the curious tale of François Mbiyangandu, the priest from the Congo who officiates atop the Kapelmuur. Pickering has an eye for the numbers and presumably a pencil and notebook in his pocket too. While you might notice the humpback railway bridge on the road into Geraardsbergen, Pickering counts “six sets of railway tracks” below. 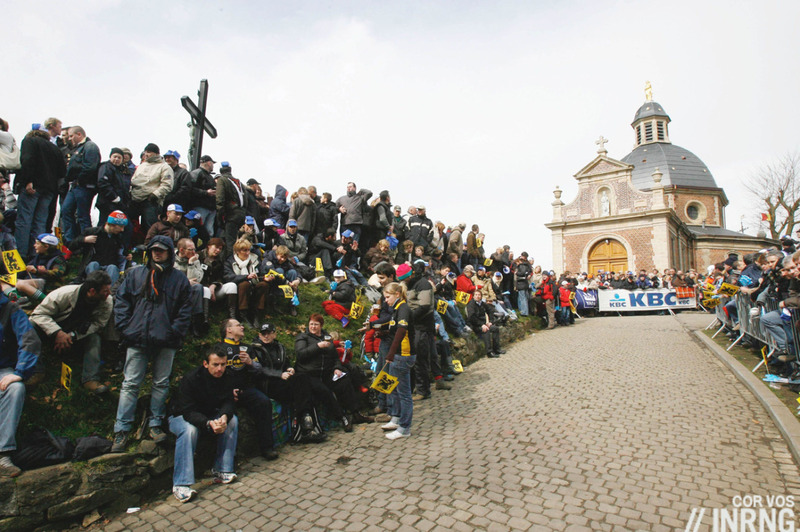 Once atop the Muur van Geraardsbergen he visits the chapel and counts 323 candles. He visits a restaurant on the Bosberg and starts to count the diners, surprised by how lively the place is given other rural parts can feel deserted. “The owners, seeing me looking around and writing down numbers, assumed I was from the local council, checking that health and safety limits on the number of customers”. Nerdy? Certainly but it’s not counting out of compulsion nor to pad out the pages. All those candles? They serve as a proxy count of how often the chapel is visited; the number of tracks under a railway bridge help tell us how big the bridge is, that Geraardsbergen is well-connected. The Tour of Flanders is such a great race, arguably the greatest one day race because of the way it subsumes the region for a day like no other event. So when a book shows up there’s anticipation mixed with risk: can it live up to the promise? It does and you’ll put the book down knowing a lot more about the race and the region. This is textual tourism with Pickering as your guide to Flanders, turn the pages and you’ll travel along the route of the Ronde. At times it’s like a collection of Rouleur-style articles where instead of interviewing the race winner we get the thoughts of someone not centre stage like a local café owner, but magazine articles are one-off commissions, this sees Pickering visit places and meet characters linked to the race. It’s threaded together via the route of the 2011 edition all while exploring themes such as how the race and region around it have changed as well as the corners that seem slow to change. 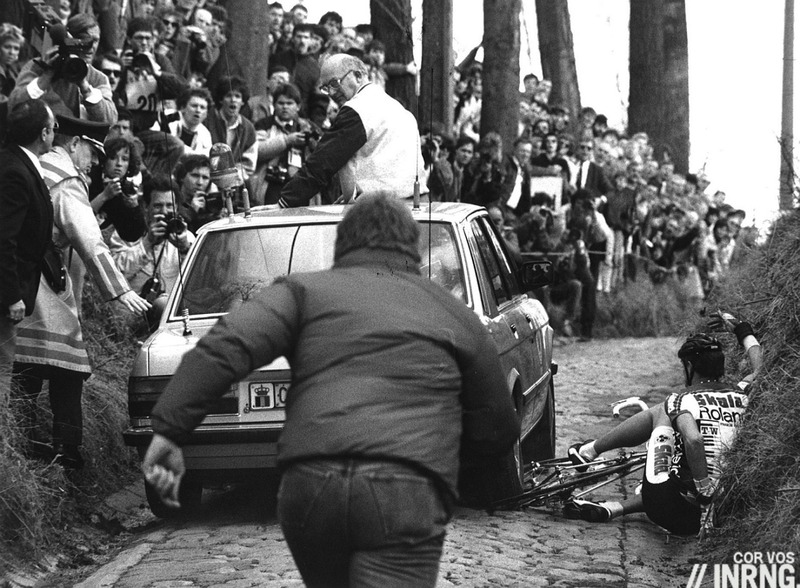 Don’t read it expecting tips on what gearing or tire pressure to use up the Koppenberg, it’s much more the psychogeography of the Ronde and Flanders and all the better for it. A PDF copy of this book was sent free for review. It is published by Simon & Schuster and available in print and e-book. There’s even a Dutch translation too. Oh, I am so looking forward to this. The publicity claims it’s the first English language book devoted to the Ronde but there’s Les Woodland’s, there’s (arguably, as it covers all the cobbled races) “For the Love of the Cobbles”, and the English translation of “100 x de Ronde”. But Pickering is an excellent writer so this is a welcome addition to the ranks. Come on Inrng. I love the website and your timely updates but (yet again) nothing about the ongoing Wiggins/Sky saga. I — and I am sure others — would love to hear your sensible, non-sensationalist take on the headlines of the past 48 hours. PS if people want going to resume the trial of Team Sky in the blog comments of a book review it’s not the place: this is about the book, the race and the region. Thanks for the review, sounds like a good read. As you mentioned the Rouleur comparison, is it a paperback, or more a coffee-table sort of thing where the photos are a big part of it? Just asking because if it’s the latter it might make a good present for someone I know. It’s more the former type of book, text and no photos. Love the photo of Jesper “Skiddy” Skibby. Not his crash per se, but that fortuitous and candid photo of such an infamous moment. It’s good the Sky thing is not getting excessive coverage here on inrng, the whole world knows Pro cycling = doping and it’s become a tiresome topic. A quick update for news of any significance is sufficient. This book would make a great addition to a cyclist’s library, and we have inrng to thank for knowing that. What an excellent subject for a book. In my shopping basket.